It's been a while since I write an update about the kids. Time flies when you are busy... And we have been busy over the last couple of months. In September, we had a fun trip to Napa for a wedding. We had fun at Train Town and were able to get great shots of Charlotte at her best. 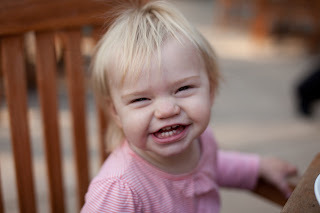 She is really becoming a flirty little girl with a oh-so cute smile! Charming! Shortly after that, we had a great camping trip to Pinnacles. Sadly, with no photo. Then, my inlaws came to town for a visit, which kept us very busy. 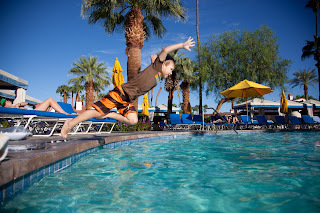 At the end of their visit, which coincided with the first rainy weekend of the season, we went to Palm Springs, and enjoyed another few days of hot weather. The kids had so much fun playing in the pool! So, what's up with the kids after all of this? First, one key thing is that traveling is getting easier and easier. Daniel can sit in the car for a long time without getting bored. Charlotte is starting to understand her environment better and she loved discovering new things. It doesn't hurt that she loves water and animals, 2 things we were able to find in our trips. On the way back from Palm Springs, our plane had a 2-hour delay, which could have been a disaster a few months ago. It was hard (because it was in the middle of nap time), but both kids did OK waiting in this tiny airport, and finding activities out of nothing. Progress! Daniel is also becoming a lot more mature, understanding the rules and going along with changes required by travel. It's really a lot of fun discovering new places with him now. On a different note, Daniel's trilingualism is developing, slowly but surely. My inlaws' most recent visit provided a boost in German language, which is now established as the home language. That said, French is making a come back. A few weeks ago, I was talking to my parents on the phone and Daniel got involved, telling them about his day in French, with absolutely no prompting from me. He also sometimes starts talking to me in French for a few sentences. Still very little, but more than ever. In terms of other progress, Daniel is starting to read/guess easy words. He really understands the concept of putting sounds together. It should only be a matter of practice from now on. As for Charlotte, she is still not saying much even at 18 months. But she understands a lot and expresses herself very well through signs. She definitely knows what she wants. In a lot of cases, she loves sitting down with us to read books. So, her routine is to get a book from her room, show us (hmmm order us) to sit in the sofa, read the book in a few minutes and repeat. This is fun, such a great way to spend time together. Charlotte seems to love doing art projects at school and always takes the opportunity when Daniel wants to draw or paint to do the same. In general, she loves following what he does. I think these are the updates for this month. I hope I will have a opportunity to write more updates soon. Maybe when Charlotte has a break through in language?